“Fake news” is simply a recent name for deception and propaganda. While the term propaganda is often associated with Orwellian images of big government, we now live in an age where we don’t have to worry about just one big brother, but rather a thousand little brothers that are running around unabated on the Internet. Although it may seem that we hear about it more now than in the past, using deceptive practices and propaganda to influence others is nothing new. For example, the success of the Normandy invasion during World War II was largely due to the complex and ongoing plan orchestrated by the Allies to make the Nazis believe several falsehoods. The objective of the deception operation named Bodyguard, Operation Fortitude South was to convince German High Command that the Allied landings would take place not in Normandy, but on the beaches of the Pas de Calais, which were the shortest distance across the channel from England. The operation used double agents, fictitious radio traffic, and fake units under the command of U.S. General George S. Patton Jr.
Operation Fortitude was so successful in deceiving the Nazis that key units were deployed to Pas de Calais to await what the Germans thought would be the main invasion. A major reason why this deceptive operation was successful is because Adolf Hitler and the German leadership were convinced the landing would be in Calais and that other operations would only be diversions. The reports and messaging from turned spies only reinforced that notion, a much easier task than trying to change his mind. The Allies used deception and propaganda throughout the war in every theater of conflict, learning several principles and lessons in the process. Today, with all the advancements in information technology, one might think it would be easy to identify and expose deception and propaganda. But the truth is, 73 years after Operation Fortitude, we are still beset with deception and propaganda in our everyday lives. Social media channels like Twitter, Facebook and Snapchat along with various news media outlets have only made it easier to dispense lies, distortions, and misperceptions. As I wrote in a previous article, fake news is hard to detect using data-mining because it can appear like legitimate news to the software and, often at first glance, to the reader. Data-mining tools don’t care whether a story is true or not; it just gives you what you asked for using search terms. Why Does Fake News Proliferate? Because We Want It To. The real tragedy of fake news is that we allow it to proliferate through our inherent bias and inability or lack of motivation to critically evaluate the stories we are bombarded with every day. One of the catalysts for fake news is something called confirmation bias. Confirmation bias is the natural tendency for individuals to actively seek out information that aligns with our preconceptions or existing opinions. For example, if you really oppose or dislike someone or something based on your political ideology, you are going to inherently seek out news stories that help reinforce that belief. Any information that is contrary or represents “alternative facts” is ignored or disregarded almost as soon as it’s introduced. Overcoming confirmation bias, along with all other kinds of biases and misperceptions, requires critical-thinking methods and evaluation processes. There are many of them readily available from the military to academic and even from both the commercial sectors and private citizens. One method that has recently made it around social media sites is one created by Vanessa Otero, a patent attorney from Colorado. Otero created the below chart in late 2016 out of frustration over how many people weren’t taking the time to evaluate what they were reading in their daily news. 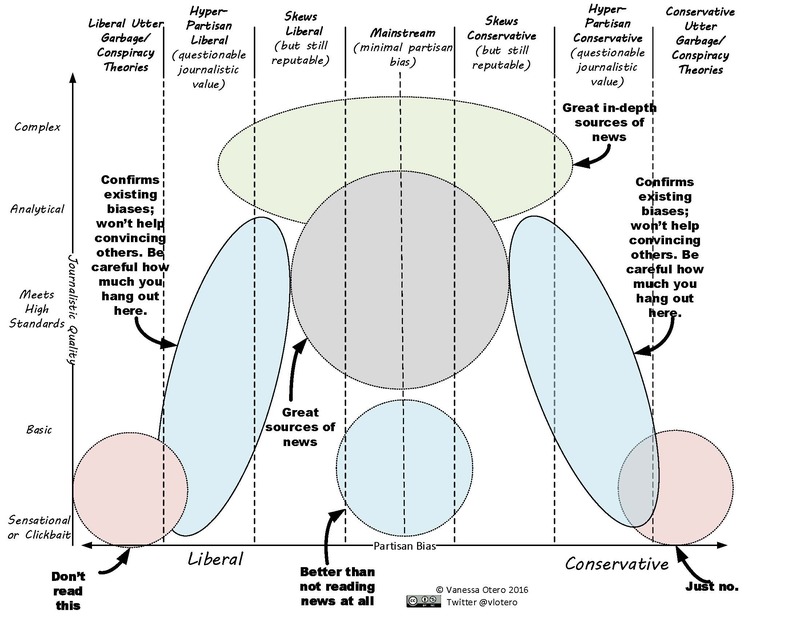 In the chart, she provides general groupings for news sources based on political bias and journalistic quality. Otero’s original chart included the names of various media sources, but below is the blank version to keep the reader from challenging Otero’s placement of ABC, CNN, etc. Reprinted by permission, with original chart found here. The structure Otero used to create this chart serves as an excellent example of how an intelligence analyst—or anyone else—can understand the sources they read on a regular basis and convey their evaluation to others. If your job includes creating a daily OSINT summary of relevant news feeds, this chart would be a simple, effective tool to help you footnote and track bias and quality. The key to Otero’s chart is the ability to adapt it to a specific situation or problem set. Case in point for intelligence analysts is the bold typed advice included in this chart. While Otero includes them as a way to steer people away from what she believes are sketchy news sources, intelligence analysts will specifically want to dive into these areas for a variety of reasons. Years ago, when I was the Chief of Intelligence for the Army’s newly created Land Information Warfare Activity or LIWA, my team was conducting broad-based data mining efforts to map out the world-wide disposition of Al-Qaeda in support of the Able Danger program. Using a data-mining tool, my analysts discovered text on a fringe website claiming that a specific business operating in Northern Africa was operating as a front to funnel money into the terrorist organization. This website also claimed (among other things) that the FBI and Russians were stockpiling weapons in northern Michigan as a prelude to taking over America. My team chose not to disregard this information. Instead, they were able to find corroborating information from other, more reliable sources that the Al-Qaeda information from the site was accurate. We would never have discovered that part of the operation had we discounted the source from the outset just because it sat on the edge of a media-evaluation chart. It was a good reminder that tip-offs and missing links that are vitally needed by analysts can come from all sorts of sources, even those that seem untrustworthy. Many disreputable sites contain a lot of good intel, you just have to do a more thorough job of evaluating the source and content. It is important we all take the time to recognize questionable sources in our jobs as well as in our everyday lives. To do so, we must learn to employ critical-thinking skills and use any of the available source-evaluation methods in our daily reading so there is no excuse for being fooled by fake news. More to the point – we all must identify fake news for what it truly is: propaganda that seeks to deceive the reader and spread its lies. Unless we are committed to reviewing both a story and its source organization, we are just setting ourselves up to be the fool, whether we do it in our jobs or through our Facebook posts. 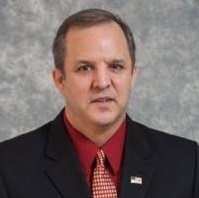 About the Author: Erik Kleinsmith is the Associate Vice President for Business Development in Intelligence, National & Homeland Security, and Cyber for American Military University. He is a former Army Intelligence Officer and the former portfolio manager for Intelligence & Security Training at Lockheed Martin. Erik is one of the subjects of a book entitled The Watchers by Shane Harris, which covered his work on a program called Able Danger tracking Al-Qaeda prior to 9/11. He currently resides in Virginia with his wife and two children.